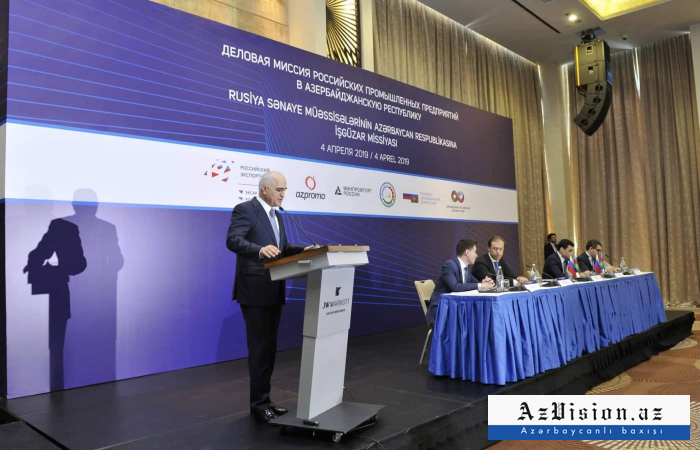 An Azerbaijan-Russia cooperation forum kicked off in Baku on April 4. Azerbaijani Minister of Economy Shahin Mustafayev and Russian Minister of Industry and Trade Denis Manturov are attending the forum, AzVision.az reported. Delivering a keynote speech at the event, Mustafayev said about 700 companies with Russian capital are currently operating in Azerbaijan in the spheres of industry, construction, trade, banking, ICT, transport, agriculture, etc. The minister noted that the value of investments by Russian companies in Azerbaijan amounted to $4.4 billion, and the value of Azerbaijani investments in Russia stood at $1.2 billion. He said that the trade turnover between the two countries in 2018 amounted to $2.5 billion, which is 20 percent more than in the previous year. “The mutual trade turnover continues to rise. In the first two months of 2019, the trade turnover between the two countries increased by 4 percent and amounted to $340 million compared to the same period of last year,” Minister Mustafayev added. Sumgait Technology Park LLC will sign an agreement on cooperation and organization of relations with Rostselmash KZ LLC and a memorandum of cooperation with Transmashholding LLC. In addition, AzOkso LLC will sign a memorandum of intent to jointly implement fencing systems with ServiceInvest LLC.